I am totally shattered. The last four days have been a whirlwind. In a joint venture between Painted Dog Conservation, Wildlife Vets International and the government vets from Hwange we have vaccinated around 800 dogs against rabies and distemper (we even saw a few cats for rabies vaccination). We set up our tables out in the bush and waited for out first patients. 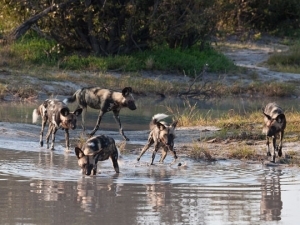 Pretty soon a small party of smiling chaps waltzed out of the thicket circled by packs of ‘dingo’ like dogs. Left to their own devices in such hard conditions, natural selection tends to result in medium build, hardy crossbreeds like these. Pampered pedigrees wouldn’t last a week out here. I had no idea how we were going to manage the twenty or so dogs that rocked up in the first wave but the government veterinary assistants got busy with the vaccines, worming and de-fleaing while the vets got stuck into seeing any with any illness or injuries with the PDC staff preparing syringes, translating, recording names and generally keeping it all flowing. By the time we were halfway through this first lot the next wave hit us and it was plain we were going to be busy. What’s amazing is that when you travel through the villages and see all the dogs milling around, you’re convinced that they are all strays but virtually all are owned, named and much loved. The veterinary team had plenty of work on as there are very few opportunities for local people to see a small animal vet around here. We saw lots of skin diseases – fleas, mange, ringworm and lice and lots of ‘poor do-ers’ – skinny, anaemic, ill-looking dogs riddled with ticks and god knows what else. Our diagnostic capabilities were hampered by lack of laboratory support and equipment so we had to treat for what we suspected and hope that the dogs’ immune systems could fight the rest if given a chance. Our ‘customers’ were grateful for any help they got for their much loved pets. Many of our patients had severe bite wounds that had been attributed to baboons but there are other dangers out there including warthogs, leopards and worse. It’s amazing just how well some of these severe gashes were already healing well. One dog had almost lost an eye in an attack that would have had me reaching for the scalpel and suture kit back home but at already a week old the wound was clean and closing nicely on its own. After the vaccinations and sick dogs had been treated we were able to offer surgical castration which even in our rudimentary field clinic has to be far better than the rusty knife alternative. It’s so hard to adjust to the very basic levels of hygiene and sterility that would be anathema to us in the UK but having seen the severe wounds these dogs shrug off we are hopeful they will go on fine. We will try and get to see some for a post-op check later this week. It will really help us determine how we do things in the future. These clinics are exactly what modern conservation should be all about – helping communities and wildlife together. Canine rabies is a dreadful disease and one that can be prevented and even eliminated if we try hard enough. Vaccination protects the people, their pet dogs and also the wildlife (especially the Painted Dogs) – so everyone’s a winner. We couldn’t have achieved a fraction of what we have done without the very kind donations of vaccines, needles and syringes, drapes, wormers, disinfectants and all manner of other kit from MSD Animal Health, Millpledge, Kruse and Safe4. The last few days have been very eventful. Seeing the huge amount of amazing work that goes on here is phenomenal. 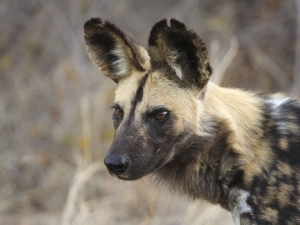 One of the flagship programs of Painted Dog Conservation (PDC) is its Bushcamp. All the local primary schools get a free 3-4 day residential trip to learn about wildlife, conservation and the environment. The highlight of their stay is the game drive. For most if not all of these children it is the first time they have ever been inside the national park that is on their doorstep and a chance to see the amazing wildlife that lives there. Seeing the excitement on their faces as they witness elephants bathing or giraffe feeding was fantastic. Later in the evening we watched the children perform a play that explained the traditional respect their communities had for hunting and the wildlife all around them and how indiscriminate snaring had impacted on the number of game and left many animals (including the Painted Dogs) dead or horribly injured. These kids are so bright and aware of the issues and marvel just as much as we do at their spectacular wildlife that they are proving to be a real vehicle for change. When they go back to their communities they carry these important messages with them. Art is what you make of it…. To get an understanding of the threats to the Painted Dogs we have been out with the Anti-Poaching Unit (APU) for a mornings patrol. When PDC was first set up, so many of the dogs were being trapped in illegal snares set out in the bush around the fringes and also within the National Park. Snares have been used for centuries as a hunting aid but the traditional methods were very different to what we see today. The free availability of fencing wire from long abandoned field boundaries has resulted in hundreds of death traps left out in the bush. The APU patrol huge areas around the PDC centre and the park boundaries removing snares and capturing poachers. The area we patrolled with them is close to the centre and has been free of snares for some time now as the poachers know they operate in this area but they also deployed further afield where poaching is still rife. The guys are well organised, disciplined and educated. 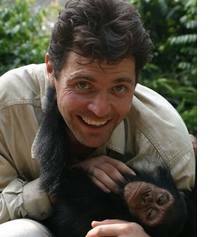 They use every opportunity to gather intelligence and spread the anti-poaching message. PDC sponsors a football league that gets the APU out into the different villages meeting other young men of their age to speak to them of their work. The guys have recently been spending a week or so out in the bush, camping and patrolling areas closer to the villages where the poaching is going on. In 2 weeks they removed over 250 snares out of this area. It’s obvious people think of poaching as a means to an end so PDC have to show them there are alternatives. This is where the art centre comes in. Taking the wire from the APU that has been removed from the bush they convert this to amazing artwork in praise of the animals they have saved. This artwork is then sold worldwide to provide an important income to the local community. It’s ultimate recycling. The artists are also trained in bead work for sculptures, drawing and the traditional basket weaving. The models they make are very intricate and beautiful. These are ideal gifts for tourists to buy as they don’t contain wildlife products such as wood and bone that may have come from unsustainable sources. I finally got my hands on a Painted Dog today as it lay snoozing on the ground. Not a natural sleep I should add but a chemically induced one as we had darted it to allow us to take biological samples and fit the dog with a radio collar. Thanks to Jealous, PDC’s expert dog tracker, we were able to find the pack of four dogs that we had to fit collars to. 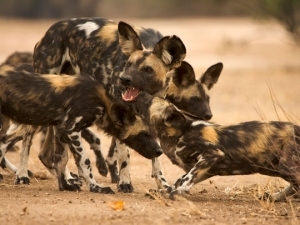 With only approximately 80-100 painted dogs left in the 14,000 square kilometres of Hwange National Park, Painted Dog Conservation is working hard to help the dogs that live around the fringes of the park escape the man-made dangers that they are so prone to. The two big killers of the dogs is snaring (see previous blog ‘Art is what you make of it…’) and road traffic accidents. The park is surrounded by long straight tarmac roads that people zoom along at 60mph and above and the dogs have little to no road sense at all. At night it’s doubly worse as the dogs camouflage is so good that you can be on them before you know it. Warning signs only work for those that heed them and it seems that with long distances to travel, people are always in a rush. The dogs are darted from a vehicle using a combination of drugs we use very commonly in the UK for domestic dogs and cats. They obviously feel the needle but react very little. Within 5 minutes they are snoozing peacefully and we can approach and scare off the other dogs. Collaring the dogs helps in a number of ways. Firstly the radio collars are reinforced with metal plates and studs to stop snares biting into the dogs necks to give them a chance to pull themselves free. This isn’t perfect as snares can fasten on legs, the body and either side of the collar, but some have managed to get themselves free as damage to the collars contest. Secondly the collars now fitted have reflective orange covers that shine out in headlights of cars. It doesn’t interfere with their ability to hunt but may alert a driver in time to brake or avoid the dogs on the road. Finally the collars allow the packs to be found. Normally only one or two dogs per pack would be collared in a research situation but with dogs being killed in snares and on the a weekly basis the remaining dogs need to be found to see if they are okay. Injured or isolated dogs can be picked up and taken to the rehabilitation centre where they can be patched up and carefully introduced into a new pack before being released to hopefully cope with this dangerous lifestyle. Without these careful interventions it was very likely this endangered beautiful carnivore would have disappeared from this precarious foothold.